Fabricated Industrial materials often include a mix of soft polymer and hard metallic or inorganic structures. Multilayer printed circuit boards are a good example where conductive metal traces are insulated by organic interlayers. 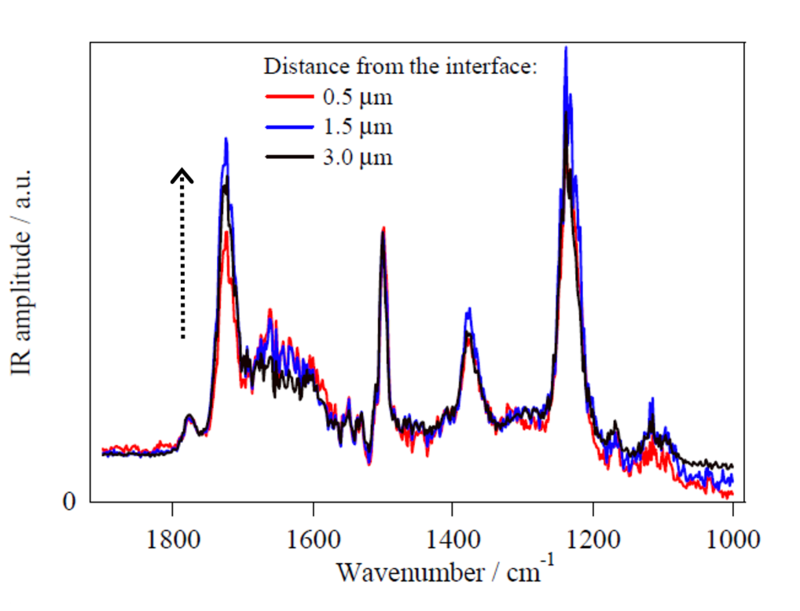 Infrared (IR) spectroscopy is an excellent tool to study the chemistry of polymers, and should be very useful to study aspects of polymers in circuit boards such as influence of metal components on curing, aging, and product failures. Scientists from Japan’s Toray Research Center recently reported on ultra-high spatial resolution IR microscopy of polyimide films on copper substrates using AFM-IR tools from Anasys instruments. They discussed their findings at the 2015 International Symposium on the Physical and Failure Analysis of Integrated Circuits (IPFA). Central to the study was a comparison of two sample cross-sectioning techniques, microtomy and focused ion beam (FIB) processing, commonly used for SEM/TEM sample preparation. 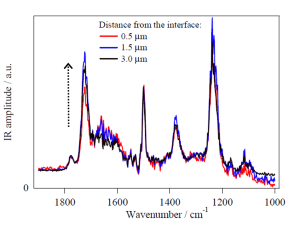 The IR spectra of all samples showed very similar profiles indicating no important structural changes to the polyimide were caused by the intense electron beam compared to microtomy. These results added confidence to the interpretation of data measured at the polyimide-copper interface exposed by FIB processing. The AFM-IR data from the interfacial region supported a conclusion that some polyimide precursor remains near the surface after curing, and possible reacts with the surface to form carboxylate groups rather than reacting with other monomers. AFM-IR technique will be a very useful tool for failure analysis studies of industrial devices combined with FIB or other conventional material science sample preparation techniques.